Vaastu is the science of the ‘living place’ or the dwelling. It can be compared to the Chinese Fung Shui. It focuses on harmonizing life according to the architecture, interior design and the landscape. A building is an extension of a person. It is connected to both the cosmic energies present in the environment and to the energy field of the occupants. Vastu is the science of building to bring health, prosperity, happiness and peace of mind. Here are some examples of concepts utilized in Vastu. There are generalized for all and especially for public buildings. With astrology these indications can be more specified for individual homes. 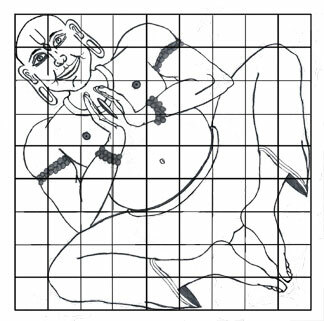 The plots refered to here are the different squares within the Vastu Purusha. 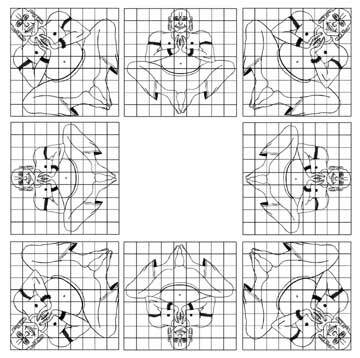 · In the central area (Brahma plot) should be built pavilion for ceremonies etc. The Vaastu Purusha is the deity responsible for the strength and happiness of the house. He is the personification of the land on which a house or building stands. He is said to be lying with his face down and his head facing NorthEast, both his feet on the SouthWest, right arm and right knee on the SouthEast, and left arm and left knee on the north west. The Earth Herself is Bhumi Ma. The Vastu Purusha is face down upon Her. She is the land/Earth itself, and He is everything that is on top of the land. Once Lord Shiva (light/knowledge) was fighting with a demon called “Andhaka” (blindness/darkness/ignorance). During the fight Lord Shiva was profusely sweating and when the sweat fell on the ground (sweat is ruled by Saturn), there came a being, who looked cruel and started devouring everything that came his way. To contain him, 45 Gods at once pounced on him and held him to the ground face down. He prayed to Brahma (the deity of Saturn according to Parashara), and Brahma pleased with his prayers blessed him saying ‘he will be the deity of all plots and offerings will have to be done to him’. So, Vaastu Purusha became responsible for well being of inhabitants of any building. The Brihat Samhita describes the Vastu Purusha. “There was, some being which obstructed the earth and the sky with his body. The gods suddenly caught hold of it and laid it upside down. Each god held down a different limb and those very gods became the presiding deities of those parts. The creator, Brahma, ordained that being to be the deity of the home” (Ch-53, Sl-2,3). The Vaastu-Vidhaana of Narada says that “the Vastu Purusha-Mandala is the magic diagram (yantra) and the form (roopa) of the VaastuPurusha. It is his body (sharira) and a bodily device (sharira-yantra) by which those who have requisite knowledge attain the best results” (VIII-26-32). East (Poorva) : Pitrustaan (Ancestors) – It should not be blocked for it is the source of Male Issues. SouthEast (Agneya) : Source of health (related to fire, cooking, food), energy and vitality. NorthEast (Ishaanyam) : Source of health, wealth, prosperity and male issues. The directions are very important in all Vedic sciences. Vaastu is a complete understanding of direction, geography, topography, environment and physics. It shows us the form, size and orientation of a building, in relation to the plot, soil, surroundings and the personality of the owner/dweller. Vedic science treats each form of nature as a divine power. Each of the eight directions of the universe is presided over by a separate deity and these deities have their own influence on the prospects of the home/building. The central portion of the plot is called “Brahmasthanam” and the presiding deity is Brahma. Knowledge of Indian mythology tells us what to expect from each of these deities/directions. Stanza 28: One should worship Lord Shiva and serve the rulers, in the direction indicated by the sign having the largest number of bindhus…. Stanza 33: Wells and tanks found or dug in directions signified by signs holding many bindhus are productive of wealth…. Stanza 34 and 35: … One should set apart a room in such a direction (highest number of bindhus) for the worship of God Subramanya and for interviewing with Army Chief, or for conducting transaction relating to lands and gold and for Cooking and for conducting homas and vanquishing enemies…. Stanza 48: The direction indicated by the sign having the largest number of bindhus should be selected for beginning education, for going to school and for recreation grounds…. Stanza 50: The spot, indicated by the sign having abundant bindhus, is to be selected for feeding Brahmins. Performing mantra japa and daily salutations. Gold oranaments and other things should be deposited in the direction indicated by the Dik having more bindhus…. Stanza 52 and 53: After carrying out the reductions note the number of bindhus. The place indicated by the sign-direction having more bindhus is favourable getting a lady married, to have the bedroom in the house and to secure a bride from the direction signified by the sign having the highest number of bindhus. Stanza 54: …Select that quarter signified by the sign having the largest number of bindhus for cultivation, for keeping agricultural implements, for constructing latrines and for throwing away refuse, and for storing fuel. Stanza 55: Total the bindhus in Aries and it’s trines representing the East; Taurus and it’s trines signifying the South; Gemini and it’s trines denoting West; and Cancer and its trines signifying North. The direction that has the largest number of bindhus is the most Auspicious. So, the best direction is indicated by the Trines that have highest number of bindhus (added together) after reduction in each planet’s Ashtakavarga. And this direction is best suited to do transactions or activities that the planet is natural significator for. N: 1 + 0 + 2 = 3The East has the highest Sodhita Ashtakavarga shows that the best place to install a Shiva Lingam and worship Mahadeva would be in the East. If this person had such a Lingam in the South, the worship would not give as good results. In the East, 108 panchaksari mantras will be enough. If the higher bindus were in the South then it would be the opposite. N: 1 + 0 + 0 = 1The Venus bindus show where the bedroom is best placed. This shows the bedroom is slightly better in the West. But it is not that important as it is a low score (2). The Temple is important to be placed in the correct direction, as the bindus are very high (7). These scores show the best place in the home to put the temple or the bedroom. The actual placement of items in these rooms is seen from the directions in the chart itself. For example, the Sodhita Ashtakavarga shows the temple is best in the East. The Sun is in Virgo in the natal chart and so within that room, the Lingam would be best placed to the SouthWest. And accordingly Mars can show where in the room the light can be, Moon is showing where the water can be, Jupiter will show the best place to put spiritual books, etc. -If 4th lord is conjoins or otherwise afflicted by a planet placed in MaranaKarakaSthana, it could indicate there is a Vaastu fault in a person’s home. -If Bhadakesh afflicts the fourth lord, the native may buy house with a Vastu fault. -If Saturn is placed in 11th (8th from 4th), buying of home will indicate major changes in native’s life. Vaastu Purusha is connected to Saturn. The 11th and 9th houses from lagna place the deity of the home in the 6th and 8th from the 4th house. At Saturn’s maturity (35-36) there will be negative results if the native buys a house. -If Lagna lord is afflicted, the DikPaalaka associated with that direction must be propitiated to overcome obstacles. In general, if a person has just bought a home or changed the home in some way, or moved into a new home and things begin to go wrong in that person’s life, then it can most likely be considered a flaw in Vaastu. give wealth and prosperity, help the well being of all persons and animals living in the house.